It looks like g3nrw.net is down. Wade’s website is a great collection of IC-7300 information (and other rigs, too). Hopefully it’s just a temporary hiccup. I’ll leave it in the links and see what happens. I missed out on the Virginia QSO Party last weekend. The conditions were terrible. Every time I turned on the rig and listened … nothing but noise. Sol was not cooperating. Nor were the Honey-dos … Saturday a new washer and dryer showed up, so we needed to get the old units out and the new units into the utility room. First, we had to get the JUNK out of the way so we could get the APPLIANCES swapped! How do we accumulate so much STUFF? It’s been raining all last night and today here on the coast in Virginia. 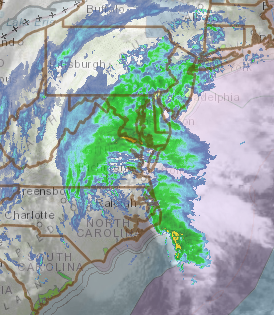 It’s just gray and dreary outside … actually quite depressing looking out the window. I’ve worked a couple more POTA stations since I last posted here. It’s now officially Springtime, so maybe the weather will smile on us soon so I can get out and do some activations. Fingers crossed! So that’s about all I have for now … not really a worthwhile post, but it does bring things pretty much up to the present. Hopefully, my ham activity will have increased by the next posting. 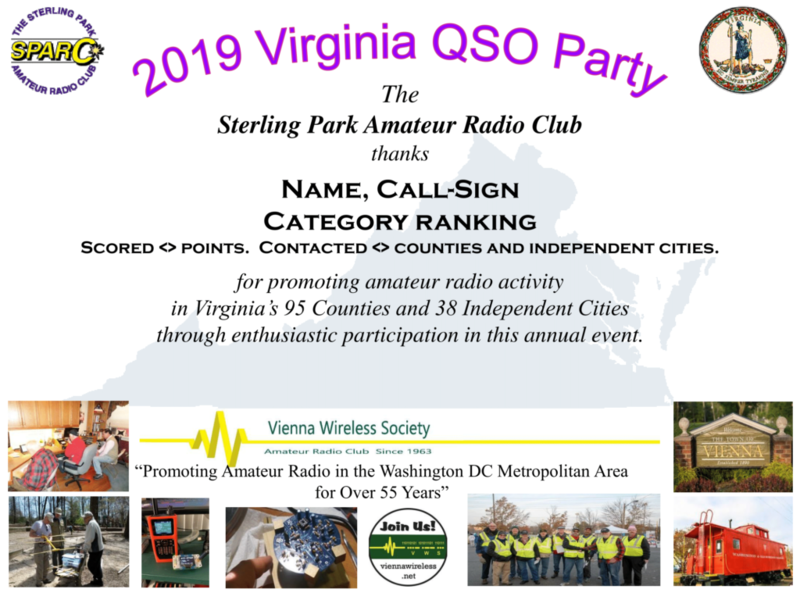 This weekend is the 2019 Virginia QSO Party, and I plan to participate. I usually get into it pretty well, but the past couple of years propagation has been so bad I didn’t even bother. Hopefully the propagation gods will smile on 40 and 80 meters this weekend. I never get into it well enough to win a BIG prize, like a plaque, but EVERYBODY gets a certificate if they send in a log. So, everybody is a winner! On another note, I just qualified for my first Parks on the Air certificate. This is the lowest level for Hunters. It requires contact with 10 POTA entities. Hey … I’m turning into a REAL certificate hunter! I’m not doing it for the glory, though. 😀 I’m doing it for the challenge. Pulling some of these guys out of the QRM and QRN IS a real challenge. Band conditions are up and down from minute to minute. FUN, FUN, FUN!! It’s a beautiful day here today … temperature is around 70 F … sunny … just a great springlike day. Too bad I’m stuck at work. Supposed to get cooler and rain tomorrow. BUT … I guess we’re lucky compared to the Midwest, which is getting nasty weather again. Oh well … can’t do anything about death, taxes and the weather! Take care guys … have a nice weekend! I got up late today, it being a holiday, and flipped on the rig. 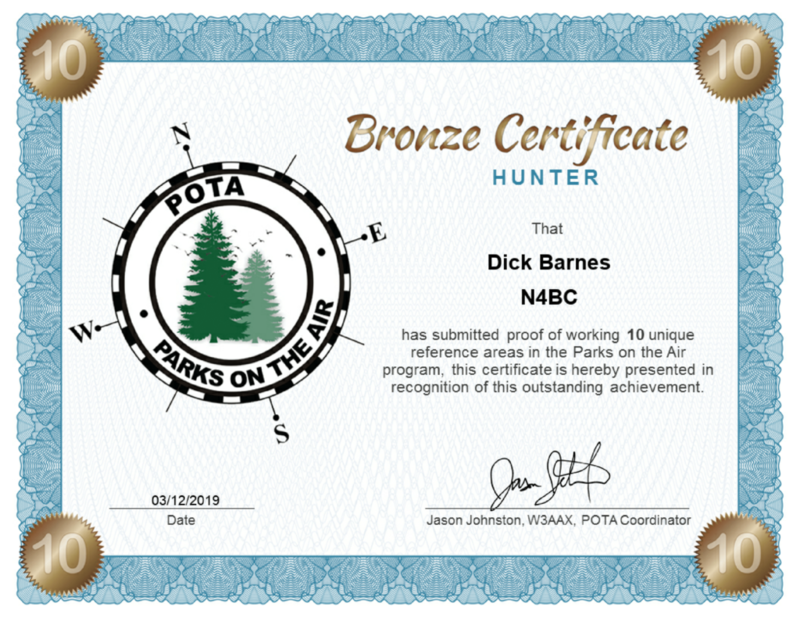 I tuned around 40 meters, and heard a couple of Parks on the Air (POTA) stations, and gave K3USI (portable on Howland Island, NY) a call, and he came right back to me with a 59. He was a good 59 as well. I also heard W4BKR, who was working from the Plumtree Island NWR and booming in at 59 plus a bunch (I could almost throw a rock and hit him from my shack). Both were handling pileups well and knocking them off one by one. Good ops! BTW, those were both SSB contacts, and I had to find my mic before I could call them 😀 . From there, I moved to see what was on the FT8 segments, and didn’t find much of interest, so I called CQ and landed Thomas, AE4TH, who lives in the Fox Hill section of Hampton, my neighboring city … probably not ten miles as the crow flies! Howdy, neighbor!! Just planning a lazy day off. The XYL is going to cook up some ribs and cabbage and sweet potatoes later for dinner, and I’m looking forward to that. I will probably turn the rig on later and see what’s going on. I’ve also got a new in-line meter for my portable ops to keep track of my battery voltage, and I need to rig up some wires and powerpoles for the input/output. Coming up next weekend is the North American RTTY QSO Party. I’m hoping to participate for some of that, but once again, I have conflicts that weekend … we’ll see what happens. Life just gets in the way of ham radio 🙂 . If you’re off today, have fun … if you’re working today, my sympathies. Sometimes working for local government has its advantages. Well, I made the annual trek to FrostFest at the Richmond International Raceway Complex the first Saturday in February, as usual. It’s about an hour’s drive from my QTH, depending on traffic in several construction zones on I-64. Although in years past I had an early start in order to be there when the doors open, this year I took my time and didn’t arrive until after 9 AM. There was a pretty good crowd, and lots of interest in the offerings by various vendors. None of the “major” vendors were there (Icom, Yaesu, Kenwood, HRO, etc. ), but that’s par for the course nowadays. Quicksilver and Ham World were there in force and were doing brisk sales. I am particularly interested in the Forums, and this year, the website only showed the ARRL forum. Upon arrival, I saw that they had added SKYWARN and Mesh Networking, both of which I had attended before at the Virginia Beach Hamfest. I did sit in on the SKYWARN again, mainly to support Howard, WZ4K, who did the presentation. It’s almost like the forums were an afterthought this year. Of course, I did make the rounds of all the vendors. There were some nice items for sale, but nothing that I needed. Some vintage rigs were for sale, and of course lots of everything else, including cookies, brownies, and candles 😀 . My pet peeve (as usual) is everybody’s obliviousness of their surroundings. People stop right in front of you to carry on a conversation and totally block the aisle. A subtle word or, in desperation, a gentle push, usually moves them, but come on guys … move to the side! All in all, it’s one of the better hamfests that I attend, and I congratulate RATS, who organize and put FrostFest on each year. Good job! The trip back home was not a pleasant one. Just outside of Richmond, I spent over an hour in the I-64 parking lot. There was an accident in a construction zone, and we didn’t move until it was cleared. By this time, my back was killing me, and I was not my usual happy self! I finally got home, and my first action was to get horizontal and take a nap! Priorities!! I had planned to jump into the NAQP this past weekend … I really did! But … for some reason I just couldn’t seem to get up the gumption to press the rig’s ON button. I had a severe case of the blahs this last weekend. I spent most of the day Saturday reading and watching a couple of movies, and took a nap! No apologies … it felt good to veg out a bit. Outside it was rainy and at times a wintry mix … just a nasty day to leave the house. My wife’s birthday was earlier in the week, and our son took us all out to dinner on Sunday evening at a popular smokehouse in the area. I decided to splurge and order prime rib … that was a mistake! That was one of the toughest slabs of meat I’ve come across in quite a while. It tasted great, but I had a sore jaw from all the chewing. Oh well, it was a nice family get-together. Too few of those nowadays. Last night was a bit lackluster for FT8. I made a few stateside contacts, but things were pretty sparse. I did try to catch the 9L1 in Sierra Leone on CW, but he had quite a pileup going and I was not a lottery winner! Good operator at the key, though … he was owning that pileup!